Engineers and audiophiles have one thing in common when it comes to amplifiers. They want a design that provides a strong balance between performance, efficiency, and cost. 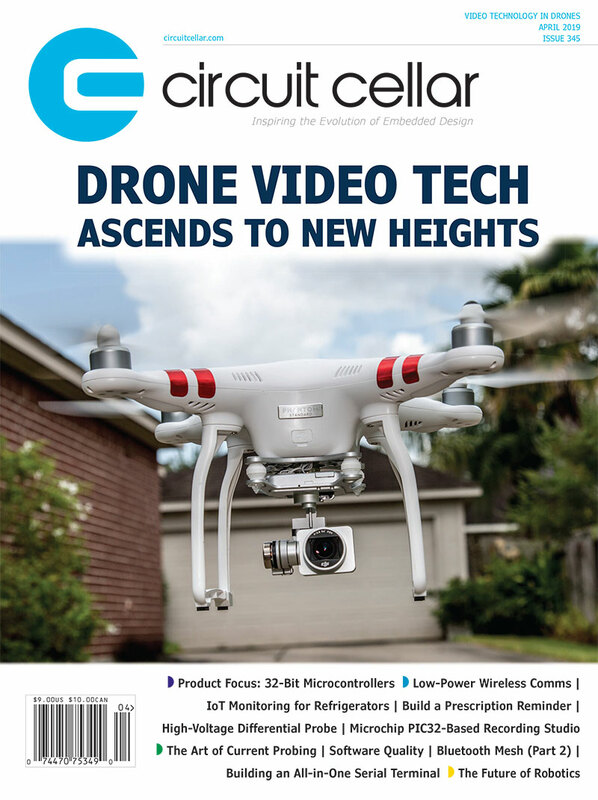 If you are an engineer interested in choosing or designing the amplifier best suited to your needs, you’ll find columnist Robert Lacoste’s article in Circuit Cellar’s December issue helpful. 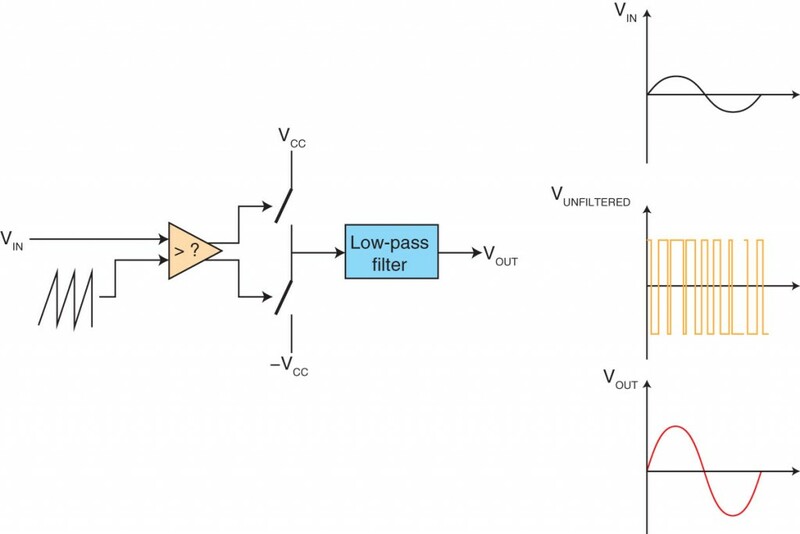 His article provides a comprehensive look at the characteristics, strengths, and weaknesses of different amplifier classes so you can select the best one for your application. The article, logically enough, proceeds from Class A through Class H (but only touches on the more nebulous Class T, which appears to be a developer’s custom-made creation). Figure 1—A Class-A amplifier can be built around a simple transistor. The transistor must be biased in so it stays in the linear operating region (i.e., the transistor is always conducting). either above or below this quiescent voltage depending on the input voltage polarity…. This solution’s advantages are numerous: simplicity, no need for a bipolar power supply, and excellent linearity as long as the output voltage doesn’t come too close to the power rails. This solution is considered as the perfect reference for audio applications. But there is a serious downside. 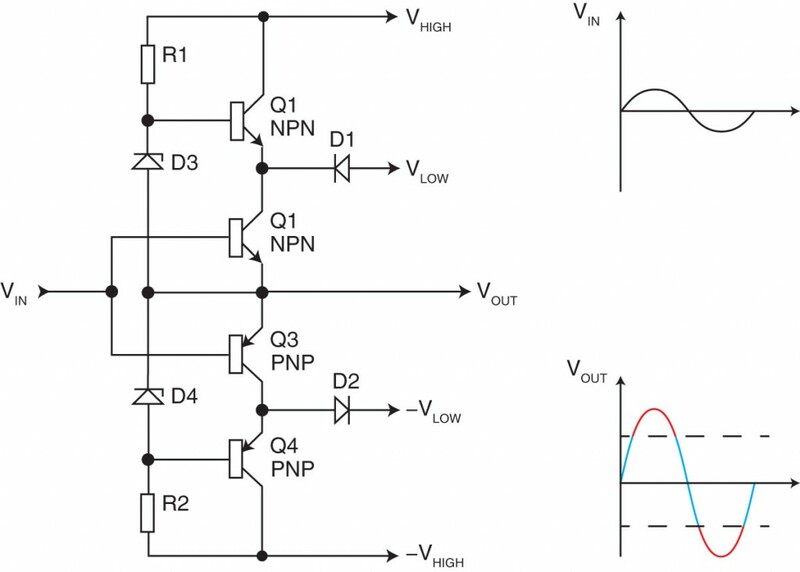 How can you improve an amplifier’s efficiency? 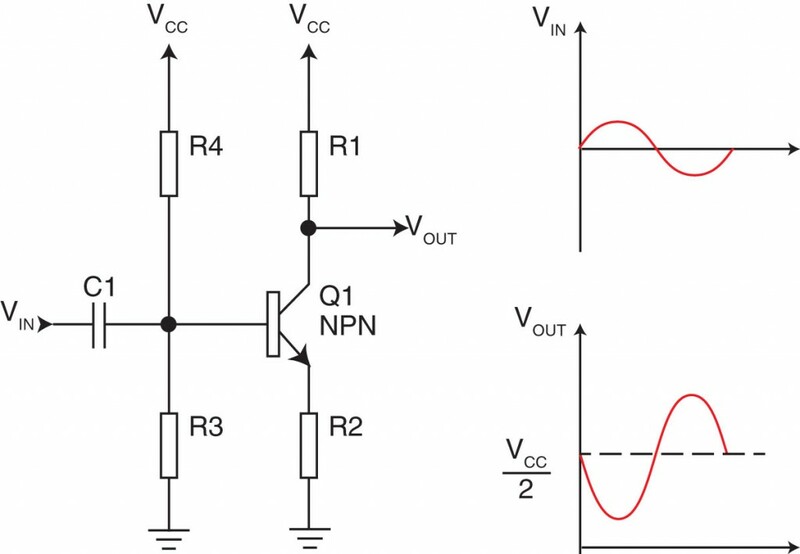 You want to avoid a continuous current flowing in the output transistors as much as possible. A Class-B amplifier has more improved efficiency compared to a Class-A amplifier. This is great, but there is a downside, right? The answer is unfortunately yes. Figure 2—Class-B amplifiers are usually built around a pair of complementary transistors (at left). Each transistor conducts 50% of the time. This minimizes power losses, but at the expense of the crossover distortion at each zero crossing. As its name indicates, Class-AB amplifiers are midway between Class A and Class B. Have a look at the Class-B schematic shown in Figure 2. If you slightly change the transistor’s biasing, it will enable a small current to continuously flow through the transistors when no input is present. This current is not as high as what’s needed for a Class-A amplifier. However, this current would ensure that there will be a small overall current, around zero crossing. Only one transistor conducts when the input signal has a high enough voltage (positive or negative), but both will conduct around 0 V. Therefore, a Class-AB amplifier’s efficiency is better than a Class-A amplifier but worse than a Class-B amplifier. Moreover, a Class-AB amplifier’s linearity is better than a Class-B amplifier but not as good as a Class-A amplifier. There isn’t any Class-C audio amplifier Why? This is because a Class-C amplifier is highly nonlinear. How can it be of any use? An RF signal is composed of a high-frequency carrier with some modulation. The resulting signal is often quite narrow in terms of frequency range. Moreover, a large class of RF modulations doesn’t modify the carrier signal’s amplitude. 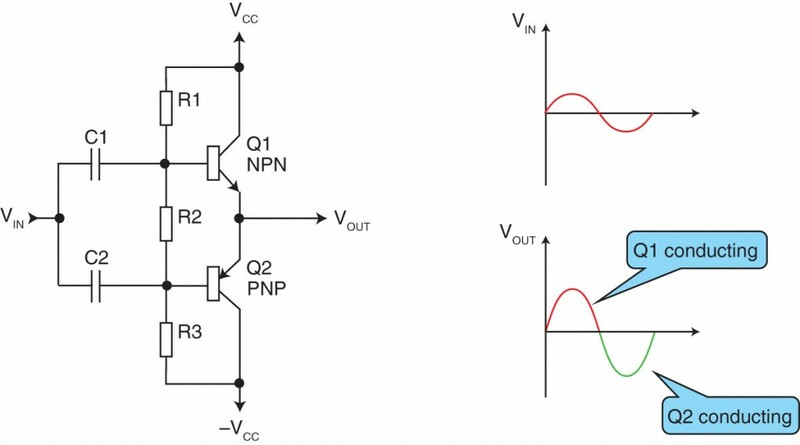 A Class-C amplifier can have good efficiency as there are no lossy resistors anywhere. It goes up to 60% or even 70%, which is good for high-frequency designs. Moreover, only one transistor is required, which is a key cost reduction when using expensive RF transistors. So there is a high probability that your garage door remote control is equipped with a Class-C RF amplifier. Class D is currently the best solution for any low-cost, high-power, low-frequency amplifier—particularly for audio applications. Figure 5 shows its simple concept. First, a PWM encoder is used to convert the input signal from analog to a one-bit digital format. This could be easily accomplished with a sawtooth generator and a voltage comparator as shown in Figure 3. 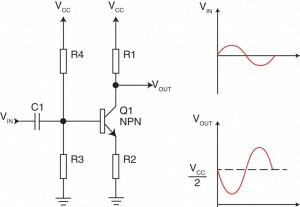 This section’s output is a digital signal with a duty cycle proportional to the input’s voltage. If the input signal comes from a digital source (e.g., a CD player, a digital radio, a computer audio board, etc.) then there is no need to use an analog signal anywhere. In that case, the PWM signal can be directly generated in the digital domain, avoiding any quality loss…. Figure 3—A Class-D amplifier is a type of digital amplifier. The comparator’s output is a PWM signal, which is amplified by a pair of low-loss digital switches. All the magic happens in the output filter. Remember that Class C is devoted to RF amplifiers, using a transistor conducting only during a part of the signal period and a filter. Class E is an improvement to this scheme, enabling even greater efficiencies up to 80% to 90%. How? Remember that with a Class-C amplifier, the losses only occur in the output transistor. This is because the other parts are capacitors and inductors, which theoretically do not dissipate any power. Because power is voltage multiplied by current, the power dissipated in the transistor would be null if either the voltage or the current was null. This is what Class-E amplifiers try to do: ensure that the output transistor never has a simultaneously high voltage across its terminals and a high current going through it…. Class G and Class H are quests for improved efficiency over the classic Class-AB amplifier. Both work on the power supply section. The idea is simple. For high-output power, a high-voltage power supply is needed. For low-power, this high voltage implies higher losses in the output stage. What about reducing the supply voltage when the required output power is low enough? This scheme is clever, especially for audio applications. Most of the time, music requires only a couple of watts even if far more power is needed during the fortissimo. I agree this may not be the case for some teenagers’ music, but this is the concept. Class G achieves this improvement by using more than one stable power rail, usually two. Figure 4 shows you the concept. Figure 4—A Class-G amplifier uses two pairs of power supply rails. b—One supply rail is used when the output signal has a low power (blue). The other supply rail enters into action for high powers (red). Distortion could appear at the crossover. This entry was posted in CC Blog and tagged amplifier, audio, Class A, Class AB, Class B, Class C, Class D, Class E, Class F, Class G, Class H, PWM, RF, signal, transistor by Circuit Cellar Staff.